Payment Mode- DD in Favour of "National Fertilizer Limited" Payable at 'New Delhi'. Educational Qualification : Qualified CA/CMA Exam or MBA Finance Degree with 60% Marks and 1 to 13 Year Experience in Similar Field. 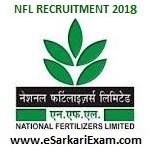 Eligible Candidates can Submit Application at the Official Website of NFL Latest by 14th December 2018. Applicants First Logon to NFL Official Website. Click on Recruitment in NFL Link. Open Recruitment of Finance and Accounts Professional. Pay Application Fee through Demand Draft. Take Print out of Online Application. Send Application Along with Required Documents and DD in A Sealed Envelope Superscribed with "APPLICATION FOR THE POST OF ------------ (POST NAME) - 2018". Send Application to the Address : "Deputy General Manager (HR), National Fertilizers Limited, A-11, Sector-24, Noida, District Gautam Budh Nagar, Uttar Pradesh - 20130". Application should Reached Latest by 21st/28th December 2018.